Sometimes hosts and hostesses and even some brides who are working with a tight budget, are tempted to do without flower arrangements on the food tables. Don't do that!!! We can always figure something out that will fit your budget. There are all sorts of centerpiece possibilities available. 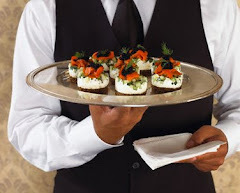 In this photo, Pesto Bruschetta is served hot from the oven on doily-lined gold and faux diamond chargers. 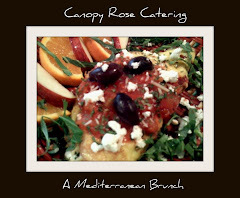 Canopy Rose Bruschetta can be customized to a client's unique taste preferences! For this event we balanced out the beef, chicken and seafood dishes with a wonderful vegetarian bruschetta that delighted both the meat eaters and vegetarians at the event. A true win-win. We even had one out-of-town vegetarian guest from Miami who was in Tallahassee for the event, ask if we would travel to Miami to cater! Well, anything is possible....just ask! "What will the food look like? How will it be presented? What will the buffet look like? How will the food taste?" These are all important questions. 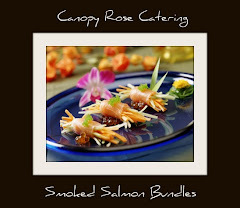 At Canopy Rose Catering, we always begin with the freshest and highest quality of ingredients and then create culinary magic! 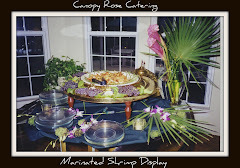 Not only does our food pop with fabulous flavors, it is presented with great style and pizzazz that is fitting for the mood of the event, This partial photo of a Canopy Rose catered buffet for seventy-five guests was set up on June 22, 2013 at a private home in Tallahassee. 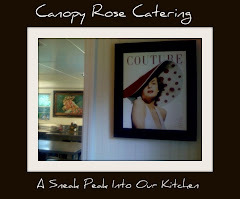 Recipes, photo and food and photo styling by Chef Kathi, Chief Yum Officer of Canopy Rose Catering. 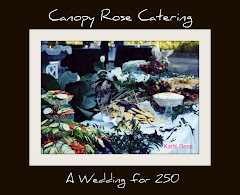 Hummus Image from Canopy Rose Catering, a Tallahassee Florida Area Catering Company. Hummus is always a popular party appetizer. For this event that we catered in Tallahassee on June 22, 2013, we prepared four bowls: one large version for the main food buffet and three small versions for strategic placement through the party space. 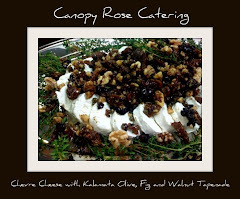 Photo, recipe and photo styling by Chef Kathi, Chief Yum Officer of Canopy Rose. 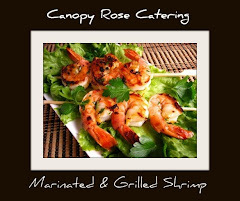 Celebrate summer with an exquisite Seafood Salsa from Canopy Rose Catering. This flavor-popping appetizer / salad has almost a ceviche-style quality, except we use boiled or steamed seafood, rather than raw seafood for your safety. Served with either a basket of tortilla scoops for the perfect summer appetizer or over a bed of greens for a lovely summer salad, this fresh lime, cilantro, tomato, red onion, garlic and seafood composition is a heart healthy treasure for hot weather entertaining. Ole! In this picture you will see two different appetizers from Canopy Rose Catering: Grilled Chicken Kebabs and Pesto Bruschetta. Grilled Chicken Kebabs, Grilled Chicken Skewers, Grilled Chicken On A Stick ... call them whichever name you choose, but one thing is for sure, you will call them DELICIOUS with a capital D! 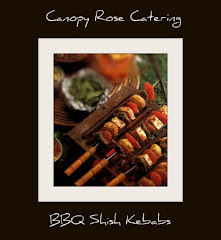 The Canopy Rose Grilled Chicken Skewers are the perfect compliment to a wide range of business, legislative and social catered events. This delicious and attractively presented chicken crowd-pleaser works beautifully for business luncheons, brunches, dinners, cocktail parties and receptions. It's also perfect for any sort of wedding festivity....engagement parties, wedding rehearsal dinners, bride's room snacks on the day of the wedding, and buffet wedding receptions. 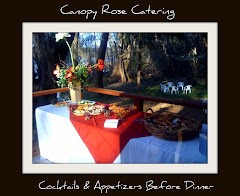 A Mashed Potato Martini Station catered by Canopy Rose Catering for a wedding reception at Bradley's Pond in Tallahassee, Florida. Guests love, love, love Mashed Potato Martini Stations, especially when the mashed potatoes are homemade, like the ones we prepare in the Canopy Rose Catering kitchen. It takes a longgggg, longggg time to peel and prepare enough potatoes for a medium to large wedding reception, but it is so worth it! For this wedding reception, the 125 guests went through over 65 pounds of our Home-made Garlic Smashed Potatoes and that is not even counting the additional weight of all the butter, cream and proprietary secrets that make our potatoes so wonderfully irresistible, or the toppings that are added by the guests. 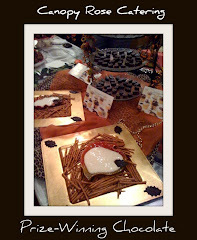 Here are some photos from a very special party we catered during the 2012 Holiday Season. 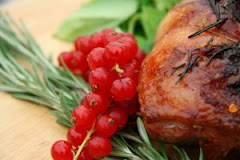 December is always one of the busiest months of the year for most of us, especially for caterers. In fact, the whole seasonal stretch beginning with the first home football game in late August or early September and going straight through to the revelries of a new year is one long and delicious decathlon of parties in my business. 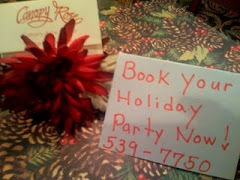 Savvy hosts and hostesses know a well-kept secret ... book early! 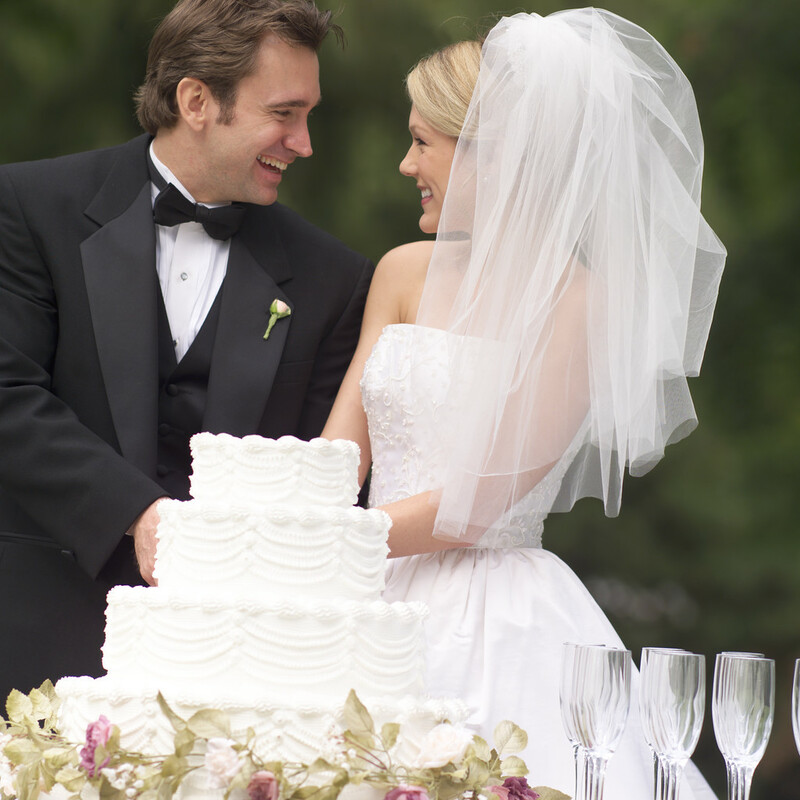 Not only will you have a better chance of locking in your favorite caterer, bartender, party rental company and entertainment; you might save some money, too! An island sink comes In handy at this Tallahassee, Florida party. 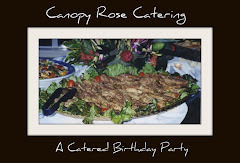 Photo and food styling by Canopy Rose Catering. A kitchen island sink works well as an Iced Shrimp Station. Our client had a peanut-shaped island sink in the middle of her kitchen and we all know where guests always seem to congregate at parties in private homes. So we decided to line the sink in greenery, fill it with ice, top it with boiled shrimp and garnish it with fresh herbs and sliced lemons. Hot, savory and irresistible; these bite size morsels of deliciousness are a tried-and-true way to kick-off a party. Everyone who likes the combination of mushrooms, sausage and cheese love these! And for non-meat eating guests we create great tasting vegetarian and vegan stuffed mushrooms, too! Just give us a heads up about any special dietary restrictions when you place your catering order. Fried Green Tomatoes, Pan Seared Scallops, Kalamata Olives, Marinated Mozzarella and Home-Grown Greens come together in this Tapas Plate with a regional twist. 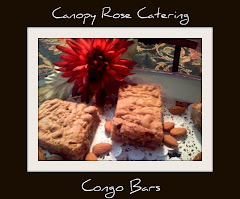 Whenever possible we like to highlight local products in our catering. Salads are simply perfect for summertime catering. For this flavor-popping salad, we incorporated the sunny goodness of the Mediterranean. Delicious! We prepared this Mediterranean inspired catering entree for a drop-off dinner in Tallahassee, Florida. Our Grilled Chicken Bruschetta is not only festive and flavorful, it is healthy, too. We give this a thumbs up for everything from office lunch catering to dinner buffets. This yummy Cream Sherry Poppy Seed Bundt Cake is among my oldest recipes and it is still tastes as lovely as the first time I ever baked it. We fill the center with a generous mound of fresh seasonal fruits and spike the cake with a spirited blend of cream sherry and farm dairy goodness. 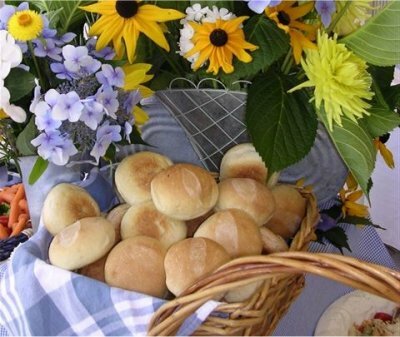 Perfect for drop-off summertime catering in Tallahassee, Florida. If there is any left over, which there probably won't be, it makes a great mid-afternoon snack with coffee, tea or sherry. When star fruit are available at the local market, we love to include some in our catering spreads. We just adore the touch of whimsy a bit of the star-shaped carambola adds to everything it touches, from appetizers to dessert. 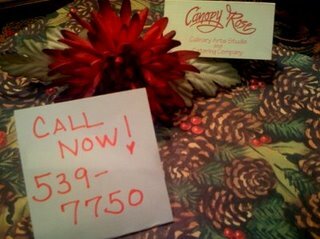 In this picture we have added a few jaunty stars to a Canopy Rose Salad. I especially like the look of a star at the end of a fruit skewer, they would be perfect for a birthday party for a princess or queen .... think citrus wand! This is a Canopy Rose Platter of Boar's Head Roast Beef and Havarti Cheese for a Slider Station. Build-Your-Own Sliders are a smart idea these days, with the ever-growing population of guests who are trying to eliminate gluten from their diets. 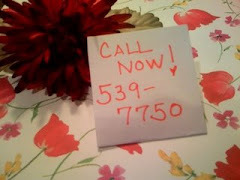 Don't hesitate to request gluten-free catering when you call us! This cheese ring is our interpretation of a famous appetizer that President Carter's wife often served in the late 1970's at the White House. 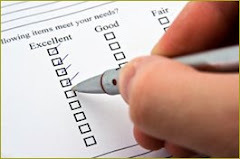 Please don't hesitate to ask us to prepare it for your upcoming event. Yes, Strawberry Pecan Cheese Ring is the perfect Southern spread for catered parties, weddings and special events with style, regardless of your party preferences. Republicans, Democrats, Independents will all reach a consensus on this.... It's positively delicious! We sometimes get calls from clients for just one or two specialty items. This is a picture of an Italian Cream Cake we made for just such a client. All he requested was one thing.... a really good Italian Cream Cake. 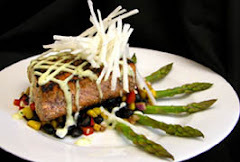 Did you know that you can special order just about anything from our catering menu? For this party we strategically placed several medium sized iced shrimp platters on tall bistro tables throughout the party space. The guests loved the idea that shrimp was so readily available and as seasoned food professionals, we really appreciate how our specially designed dishes keep the shrimp perfectly chilled to the last bite. 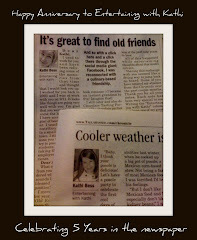 I remember the first time I experienced hummus, I was about twenty years old. Somehow a friend managed to convince me that despite the terribly homely appearance, the taste was quite enjoyable. "I bet you can't eat just one bite," he teased as he offered up a small scoop atop a bite-sized pita triangle. 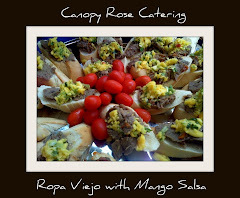 It was good, real good, but not nearly as good or as lovely as the Canopy Rose Roasted Garlic Hummus that we whip up in our catering kitchen near Tallahassee, Florida. Hummus is a perfect party food. 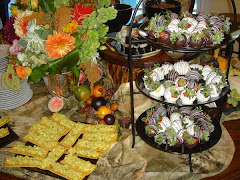 This is one of my favorite new creations that I think our Tallahassee catering clients will absolutely love! The flavor really pops with a wonderful complexity. I can see serving this at everything from catered office luncheons to wedding receptions! 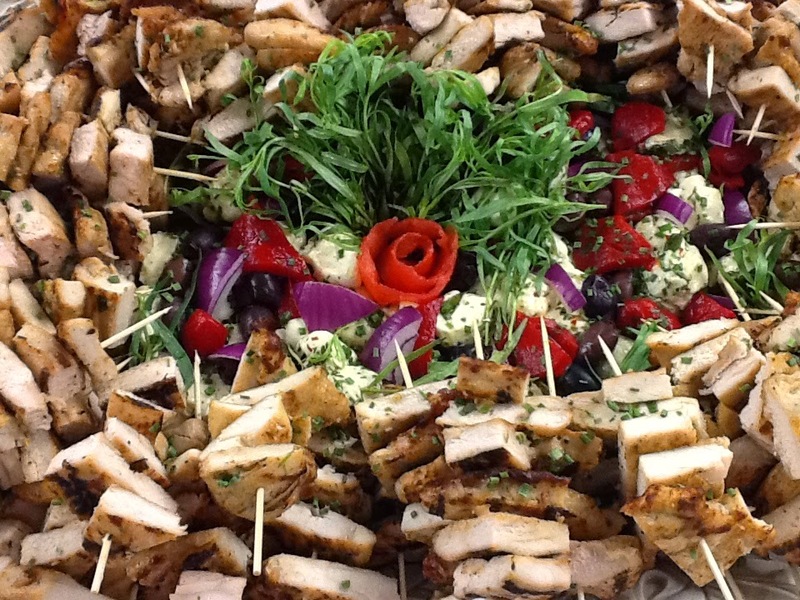 Chicken Pecan Salad is another popular request for summertime catering in Tallahassee. 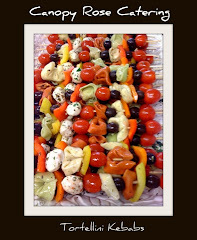 This image shows a recent salad we prepared in our catering kitchen and delivered for a drop off office luncheon in Tallahassee, Florida. Yum!!! 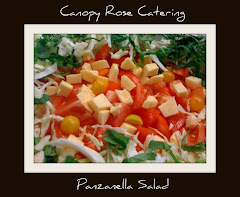 Canopy Rose Salad Samplers are a favorite menu item during the sizzling days of summer. This image shows a recent Shrimp Paella Salad we prepared in our catering kitchen for drop off catering in downtown Tallahassee. Delicious! 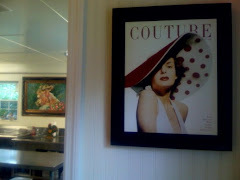 Whenever possible I try to snap some photographs at our catered events. Here are a few wedding pictures from Goodwood Museum and Gardens and Pebblehill Plantation that I just discovered on my Iphone.